Thread: How do I use the classifieds system to buy and sell items? We understand you may be impatient to get on with placing your advertisement, but we would ask that you please read this post carefully, in order to avoid any confusion as to how to use our classified ads system. It is important to us that we do as much as we can to help protect sellers and buyers from fraudulent transactions. 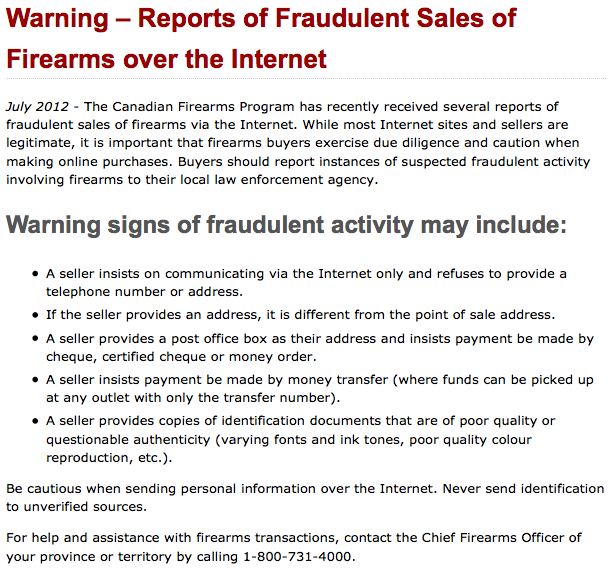 On-line selling firearms over the Internet has become more of a risk in the last few years, with warnings such as the one in the pic being published by the RCMP here in Canada . Regardless of which country you live in, we want to offer a safe environment for our members to be able to buy and sell within their own country's borders, but also where permitted, to be able transact with members from other countries across the world on our site. A special note of caution if you decide to use PayPal to make or accept payments. Make sure you do so carefully and for permitted items only. PayPal prohibits all account holders from buying or selling any type of firearm and certain firearm parts and ammunition. Firearms – Include all rifles, shotguns, and handguns, whether they are intended for use in sporting, as collectibles, or as curio and relic firearms. These items are prohibited regardless of their present working order. Important: If you are selling an item that falls into one of the PayPal categories mentioned above, please ensure you collect payment DIRECTLY from your buyer through another method other than PayPal. Also, please ensure your buyer does not use the PayPal service to purchase any PayPal prohibited items, but rather contacts you directly to arrange payment for the item, plus any shipping charges. If you are looking to sell, buy or trade an item, obtain an appraisal on one, report a fake, use our site dispute resolution, or request mediation help on a deal gone bad, then please go to the Guns, Parts and Accessories Quick Shopper Area and select the appropriate general forum that meets your needs. If you want to get right to selling, buying or trading an item and start viewing other member's ads, then within our Guns, Parts and Accessories Quick Shopper area, there is a familiar looking forum layout titled WTS/WTB/WTT (Want to Sell, Buy or Trade) Forum. You can access it either by clicking on the forum link when viewing the Guns, Parts and Accessories Quick Shopper area, or if you look at the top navigation bar for the site, you'll see a drop down box button titled Classifieds, from which you can click on and select the WTS/WTB/WTT (Want to Sell, Buy or Trade) Forum anytime. Once you do that, you'll be seeing a list of current advertisements by members who are selling, searching for items to buy, or perhaps wanting to trade. Their ads are listed in order from the newest to the oldest, although you can click on the forum column headers anytime and change the sort order. To view an ad that interests you, simply click on any thread and read its content. All posts in the WTS/WTB/WTT (Want to Sell, Buy or Trade) Forum are READ ONLY and no public replies to the original thread created by a member are permitted there. ONLY the member who created the first and original thread (advertisement) desiring to WTS (Want to Sell), WTB (Want to Buy), or WTT (Want to Trade) an item, is able to edit and delete that original post. There can only ever be ONE post in any given thread and neither the original thread creator, nor anyone else can reply to that original thread. If another member wants to contact the member who placed the original ad, they should look to see if there's a "Send PM" button -> located in the bottom right area of the original post, or another option, click on his user name shown in the left panel of the post to view the drop down box, then go to his profile to send him a PM or email there, if he permits that. Note: If you place an advertisement yourself and you do not have the options to Receive emails from other members or Receive PM's (Private Messages) turned ON and enabled, then it will be a waste of time because no other member will be able to ever contact you about your advertisement. Check your Personal General Options to make sure you have these activated properly. To place an ad yourself, look in the top left corner of the WTS/WTB/WTT (Want to Sell, Buy or Trade) Forum listing and you'll see a button titled +Post New Thread. Click on it to create and submit your ad, a similar process to creating a standard post. Note: ALL advertisements for selling an item must contain an asking price for all items being offered!! Each advertisement must have a prefix selected, so it identifies to other members what type of ad you’re placing, or the current status of an existing ad. These prefixes can be changed (edited) by the original poster only, once the status of his advertisement changes. For example, the original poster might start out his ad with the prefix For Sale:. Once someone offers to buy his item and they start the transaction by sending money, the original poster could change (edit) his ad to read Sold Pending Funds:, which lets other members know that the item is on hold until the funds are received. Once the funds are received and everything is satisfactory, the original poster could once again change (edit) his ad to show the prefix SOLD: and let the ad stay in the listings, so other members know that it’s no longer available. Some tips ..... Before buying or selling an item, or to help with valuations, you might want to check postings in our Appraisals, Fakery, Dispute Resolution & Mediation Forum (click here). If you feel you've been wronged as the consequence of doing a deal with another member, either here or on another Internet forum, then you may open a public line of communication with them using our Member Disputes Forum (click here), in order to attempt to resolve the matter. It's specifically designed for dispute resolution between members on deals gone bad. The main Appraisals, Fakery, Dispute Resolution & Mediation Forum should not be used for that purpose. Finally, in response to a number of requests from members, we've acquired and integrated a member-to-member Classifieds Feedback system called iTrader. It can be used for all types of transactions within the WTS/WTB/WTT (Want to Sell, Buy or Trade) Forum mentioned above. It gives members a clearly defined method to handle positive, negative and neutral feedback, as it pertains to transactions they may have experienced with each other. The system is really easy to use and the member's trader rating appears in two places. First it may viewed under his standard member profile as a separate tab of information. To see your own profile and iTrader Feedback, look at the top right corner of the web site screen and click with your mouse on the phase My Profile. Second, you can look at the left panel of any member's posts under the phrase iTrader Rating. You may click on the number beside that phrase and view any member's iTrader Detailed Information, including what previous buyers or sellers had to say about their experience with them. It also handles direct feedback based upon a specific ad, or can be used in a general sense without needing a link to any ad at all. Once you've completed a transaction with another member and it you wish to leave feedback about it, simply click on the small green check-mark (see right pic below) titled Rate Seller, which only appears in the first post of any advertiser's thread. All ads posted in the Quartermaster Stores on Milsurps.Com are published in good faith without verification. Milsurps.Com reserves the right to remove, classify, revise or censor any ads for any reason, at its sole discretion. On-line classifieds posted in the Quartermaster Stores on Milsurps.Com does not imply under any circumstances that we accept responsibility for the accuracy or otherwise of any ads, nor is any kind of warranty provided, whether express or implied, including but not limited to, implied warranties of merchant ability, fitness for a particular purpose, or non-infringement of any third party's rights of any kind. Milsurps.Com reserves the right to insubstantially change ads and messages described therein, as well as this legal disclaimer, at any time. The service may be unavailable from time to time for maintenance or other reasons. Milsurps.Com makes no warranty that the service will meet the user's requirements, that the service will be uninterrupted, timely, secure or error free. Buying and selling through the Quartermaster Stores on Milsurps.Com is available only to members who can form a legally binding contract under applicable law. These two services may be used only for lawful purposes. Last edited by Badger; 05-25-2017 at 05:43 AM. Where did the Classifieds go?